Thread: TWSBI Aurora: who's picking one up? If it wasn't green I might have resisted. Mine should arrive tomorrow. 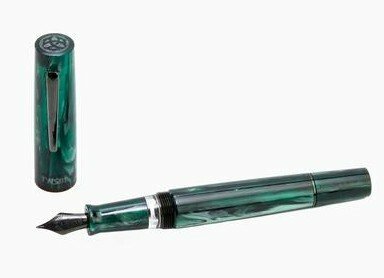 Re: TWSBI Aurora: who's picking one up? Yes - green is my favourite colour. Mine is out for delivery (UK) today. Looks nice, but I hope it doesn't crack! Is this a joint creation with Aurora S.R.L., Turin? If not, I wouldn't be surprised if these have already been cut off for trademark infringement. It's just too obvious. Last edited by FredRydr; March 23rd, 2019 at 03:48 AM. Last edited by junglejim; March 23rd, 2019 at 11:25 AM. Any lawyers here who can elaborate? It’s been about 15 years since I sat through Trademarks and Fair Use, so this is a bit outside of my wheelhouse, but I don’t think TWSBI is in any danger here. While Aurora can register the *mark* “Aurora”, that doesn’t grant to them sole and exclusive use of the *word*, even within the same industry. TWSBI clearly chose the name because it’s a term in common use which aptly describes the appearance of the pen. It’s a model name, not a mark, so there’s little likelihood of brand confusion or dilution. Aurora can no more prevent TWSBI from using the term “aurora” then they can Diamine. At least that’s my legal opinion based on a half-remembered class from law school. Well, yes, it HAS an ink window—as should any opaque piston filler—but it’s further forward on the section than the Optima’s. Indeed, though it has a more dramatic integral flare on the section rather than a flared metal trim ring, the TWSBI Aurora’s section is very similar to that of the Classic.